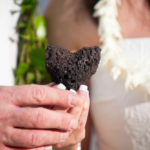 There are so many beautiful beaches on the Big Island, but there is another option and that is to get married on a boat. 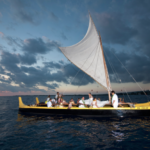 Hawaii has larger type cruise vessels as well as a Hawaiian canoe like the one this couple was married on. They started with photos outside of the home doing a first look as well as posed photos of the bride and groom and family. They loaded onto the boat outside of the King Kamehameha hotel. Because they had so many guests they had an additional two other boats to follow along side. The wedding was complete with dolphins jumping and a beautiful sunset.